I can not tell you about its monuments, its museums or its entertainment listings; there, there are neither architectural displays, nor luxurious hotels. 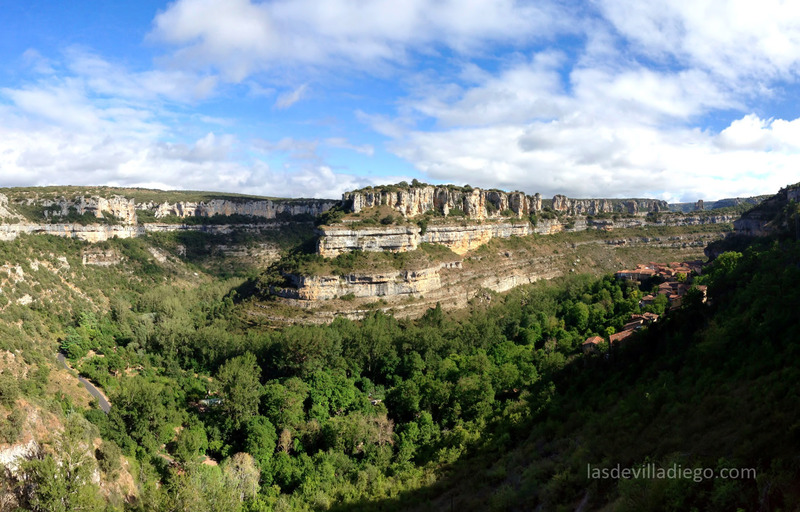 So, why should you visit Orbaneja? What will you find in this small town? Just beauty and serenity. It is an ideal place just to be in, to stroll around, to sit for a while, to listen to the murmur of the running water and to breathe some fresh air. 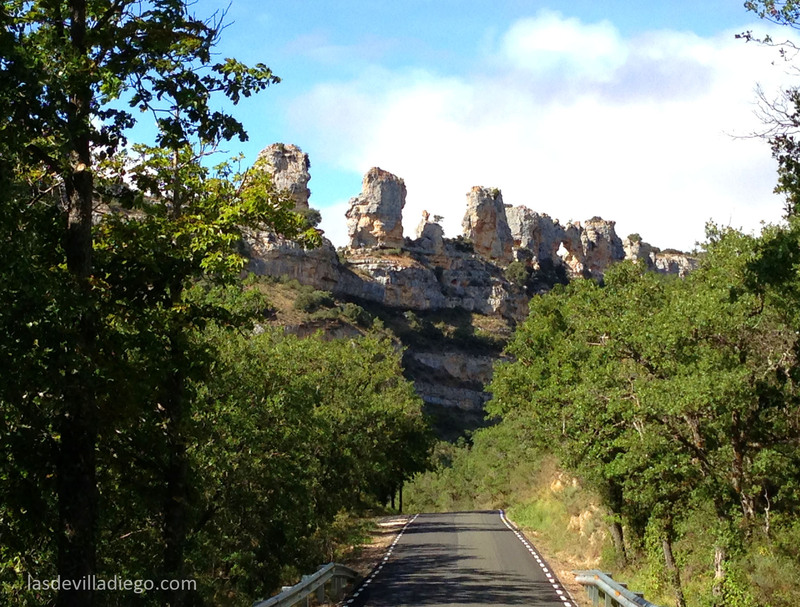 The road to get there is fantastic for a motorbike ride. 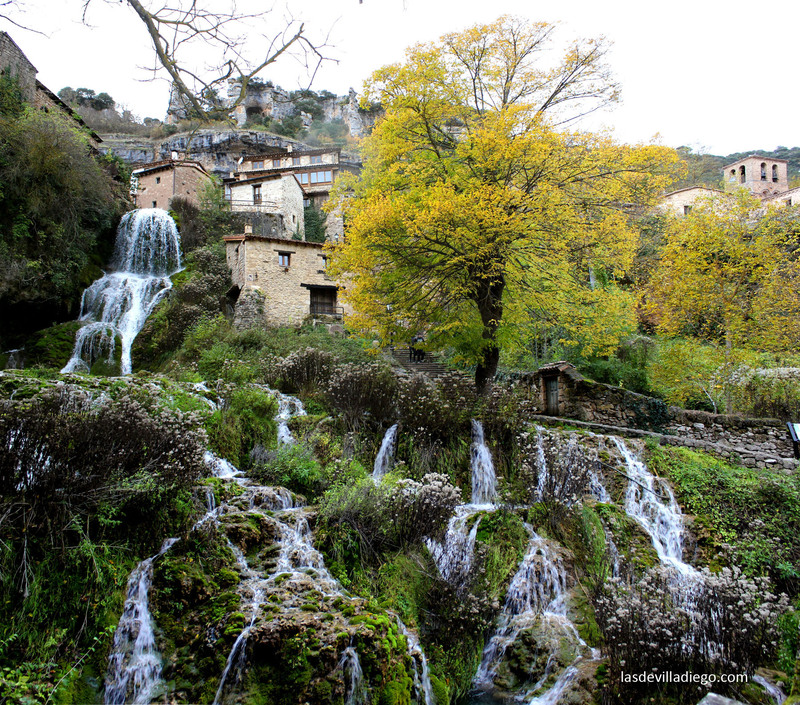 When you drive past the breathtaking karst landscape of the Canyon of the River Ebro, a wonderful waterfall will welcome you. 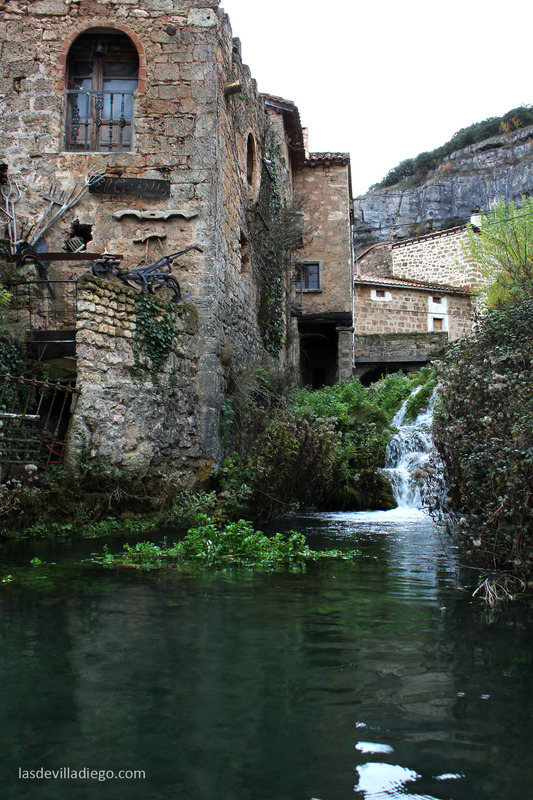 It springs up on top of the village, and it falls down forming small ponds all the way down to the river Ebro. We last went there a few days ago. A usual autumn Sunday, rainy and cold. The waterfall had quite a water flow and it looked magnificent, although it is in spring when it looks at its best, due to the melting of snow. We went up the steps by the waterfall. 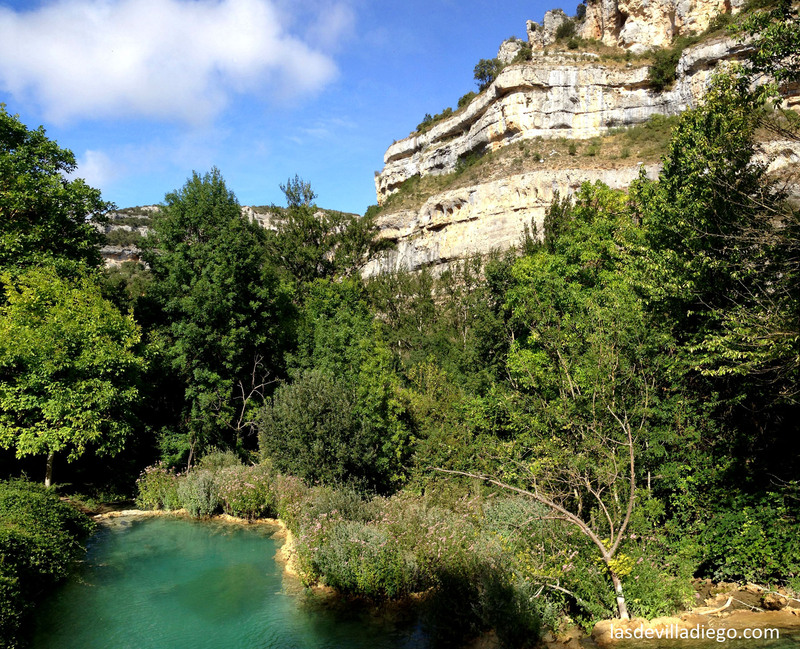 In spite of not being our first visit, I couldn’t resist its magic and the pleasure of looking at the ponds of clear water, the stone houses that seem to hang from the wall of the canyon or the amazing view one has from there. The Castle always attires me. 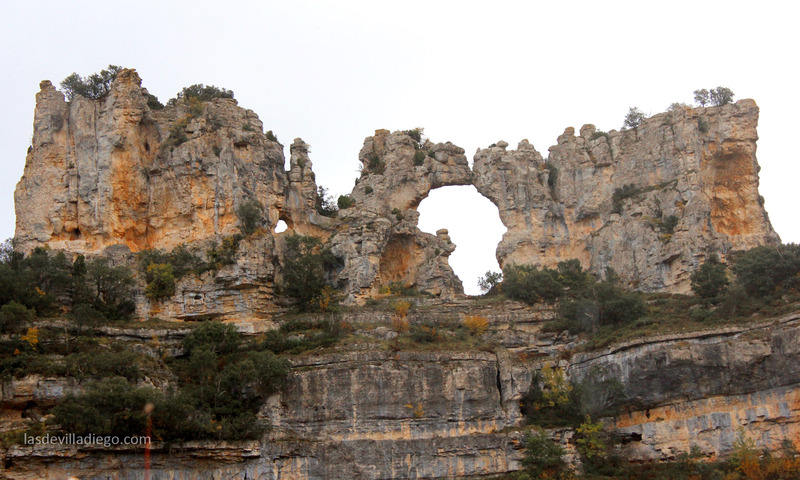 It is a group of calcareous structures distributed all along the top of the Canyon, resembling ancient watchtowers. Among them, it is remarkable El beso de los Camellos (the kiss of the camels), which shows -between their bodies-, the shape of Africa. Those of you who have already been there know what I am talking about. Both the waterfall and the camels are identifying marks of Orbaneja. 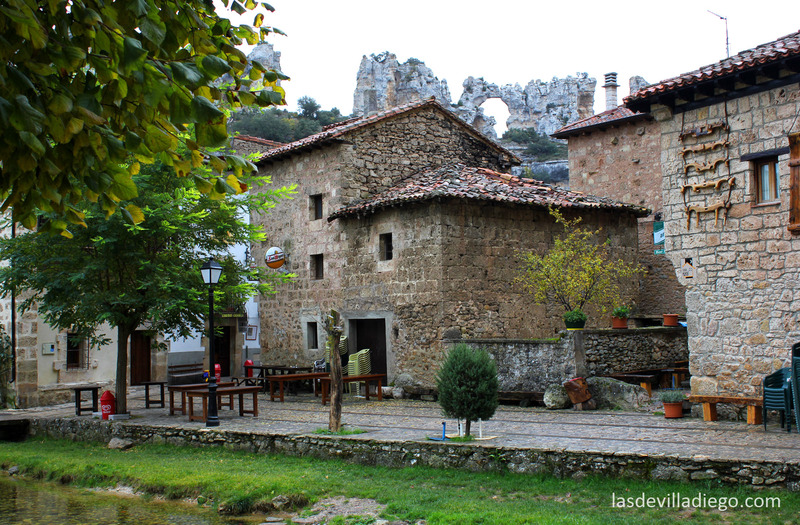 The small town, built on tobe terraces formed by the water along the centuries, keeps a certain medieval atmosphere: its streets are narrow and its small crammed houses, are similar to those found in the province of Cantabria, just a few kilometres away. 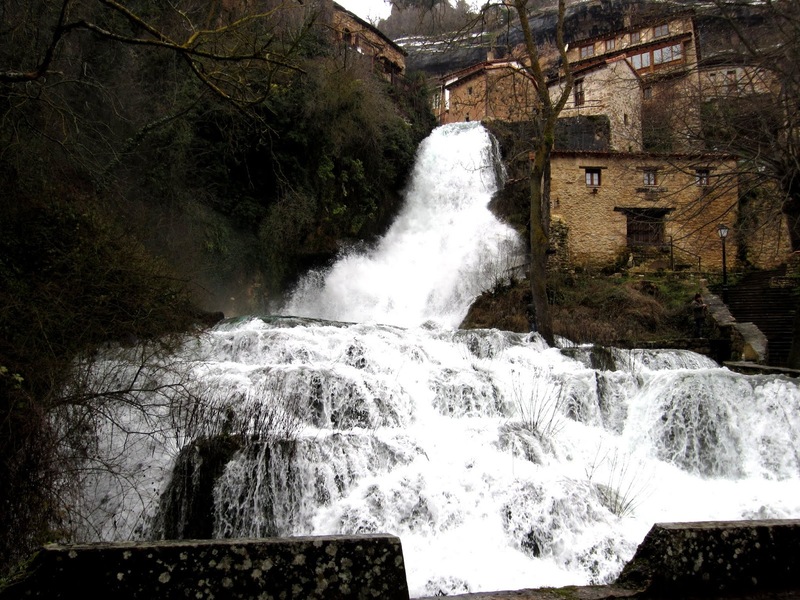 It is divided by a stream that crosses it (ending up in the waterfall) and which springs up from the mountain core through the so called Cueva del Agua – the cave of the water- whose entrance is in the main square. We couldn’t go in this time as it is closed for the autumn and winter. The entrance ticket is not expensive, about 2€, so if you have the chance to go to Orbaneja in spring or summer, do not miss the chance to see it. First the visit was made with torches, which made a charming experience. Now, there are some discreet lights along the cave. It’s more comfortable, although not so magical. Never the less it is really worth it. 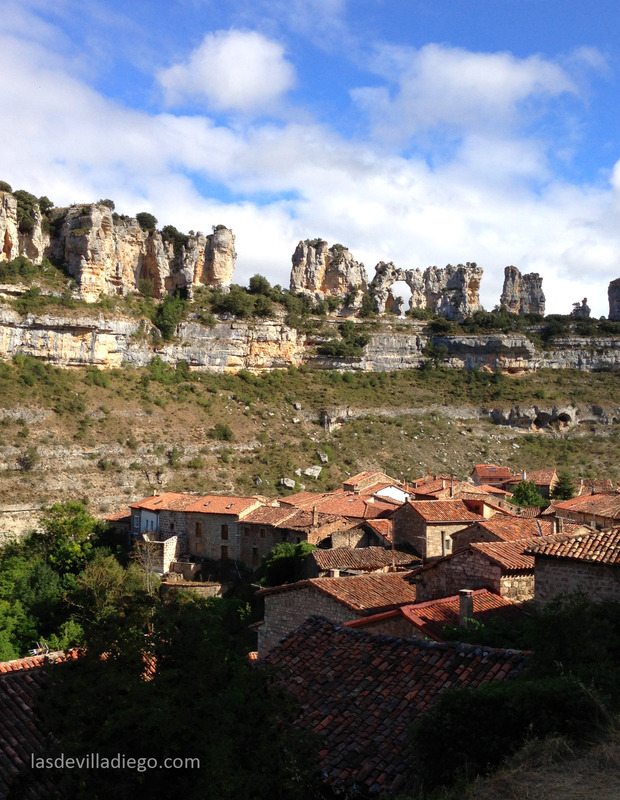 One more piece of advice: have a look at the moor of Bricia, surrounding Orbaneja. 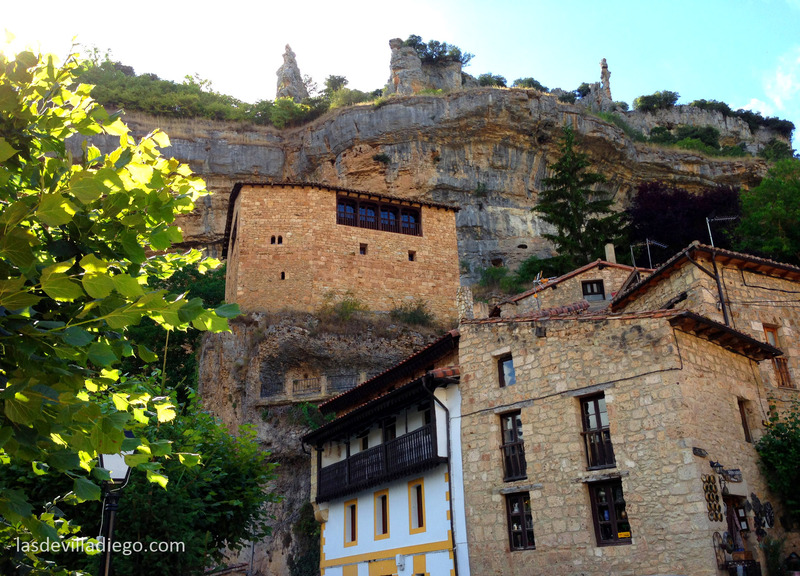 You will find a sign saying ‘La ruta de los chozos’ ( route of shepherd’s stone houses) in the square. 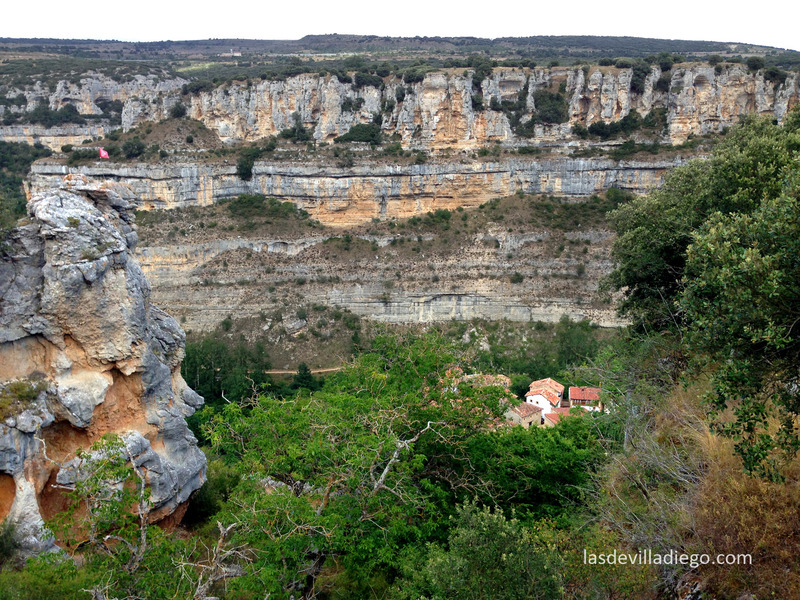 The hike hardly lasts an hour and you will find spectacular views of the Canyon of the river Ebro. The road is easy and accesible for everyone no matter their age. 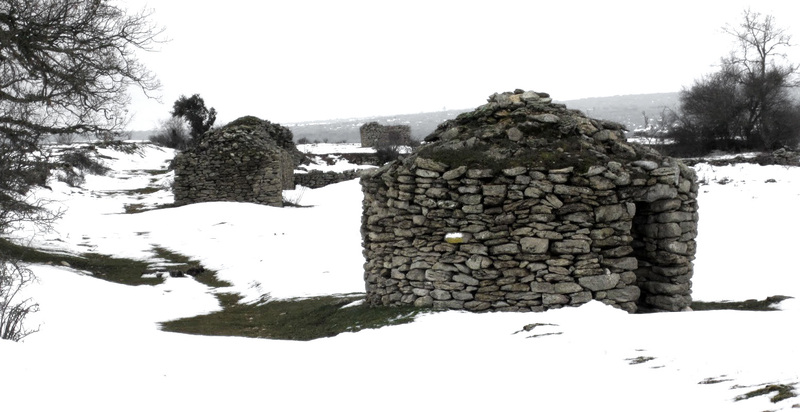 Once in the moor, you will be surprised by the stone buildings along the way. These ‘little houses’ have either a round shape (las chozas) or a square/oblong one (los casares). The former were used as barn, shed and shelter by the peasants who went up there to work the terrain. The latter were used to keep the cattle. The most remarkable trait of those old buildings is their false vaulted stone roofs, which are kept mostly intact. It is amazing the way these structures have lasted, looking so unstable, lacking mortar or any other material to hold its pieces together. It seems they would fall down just by taking one piece away. We have never tried, just in case. The way down from the moor to Orbaneja is impressive. Whenever we go on a break to Orbaneja, we end up having some beers and some plates in any of the terraces set up in nice weather seasons. This time, however, the weather made us cut down the length of the walk and look for a restaurant in which to get some shelter and some food. After evaluating the choices, we headed for ‘El Arroyo’, in the centre of the village. It is a simple place, with a dining room upstairs. I guess you need to book in advance during the high season because this time it was almost full. The menu was varied and its price more than reasonable: 15€. Plenty of delicious homemade food: stew, lamb chops, sweetbread, lamb… The service was efficient and pleasant. In short, we left satisfied and fulfilled. Some curious information: the toilets are in the house opposite the restaurant, in a building that looks like an old stable. 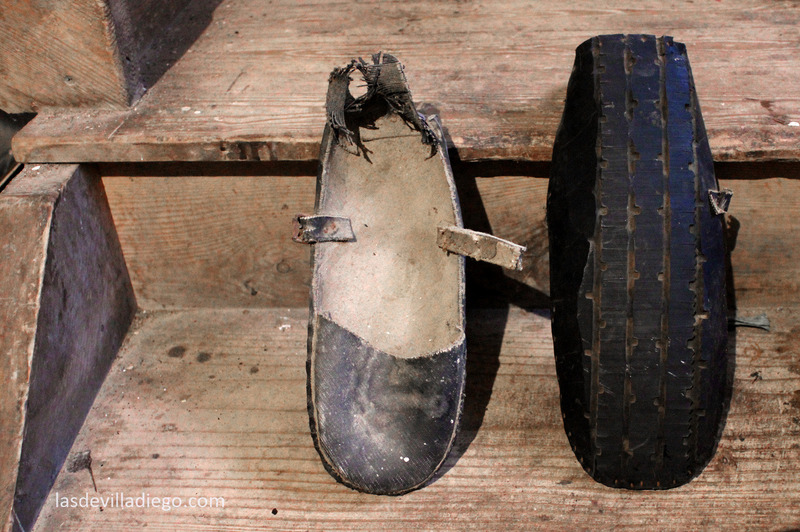 There we found an amusing sign of inventiveness: a pair of clogs made with motorbike tyres. They were worn away. Seeing these dutch clogs takes you back to the times when recycling actually happened because there was no other way. You can feel the hardness of the moor where men herded their livestock, the cold and the rain. And you feel you have witnessed something special, which cannot be expressed with words.